Milk, dark or riddled with nuts – it’s hard to find a single person who’s day isn’t made better with a little chocolate! With hundreds, if not thousands, of ways to enjoy the gift of the cacao tree, chocolate is arguably one of the most versatile foods in nature. What would the world be like without a chocolate chip cookie, a chunk of chocolate fudge birthday cake, a bowl of spicy-sweet mole or the occasional melt-in-your-mouth truffle? For those ascribing to a vegan lifestyle, be it for economical, health or ethical reasons, a lot of those decadent chocolate treats are off limits. Yes, vegan chocolate chip cookies existed in the 1960’s “hippie” era, but if you’ve ever had one of those “traditional” vegan concoctions you know they were anything but decadent! Fran Costigan is out to bring the indulgence of chocolate back to everybody’s table with her new book: Vegan Chocolate. Aptly titled, Vegan Chocolate makes no mystery as to the treats within its pages. As if the title wasn’t enough to sway you, the front cover displays a to-die-for looking chocolate cake (sadly, that recipe is not indicated in the book, but I believe it’s Sachertorte (p. 105)) and almost every page is laced with Kate Lewis’ stunning photography. A full index caps the almost 300-page book off, and is a great resource for that “I-need-chocolate-now” moment, and each recipe section also has a listing of its offerings at the beginning for more leisurely browsing. Along with the wealth of recipes, Costigan also includes an indispensable guide to “Ingredients, Sweeteners, Chocolates and Equipment” (p.12), a well-stocked “Resource” (p.290) list, a suggested “Reading List” (p. 296) and even a Rolodex-worthy compilation of relevant “Organizations and Publications” (p.297). Costigan proves time and time again her worth as a culinary artist – vegan or no – and definitely erases any notion of vegan food as stuff for health gurus only. Recipes range from a simple Chocolate Sorbet (p. 209) to gourmet Lemon Olive Oil Truffles (p. 44) and an extravagant Raspberry Chocolate Silk Tart (p.165), and it’s truly hard to believe that absolutely no dairy, eggs or even refined sugar are components! As fancy and complicated as the recipes seem to be, rest assured that Costigan has done her due diligence in this respect too and makes replicating her creations as easy as possible. Of course, I couldn’t wait to get into the kitchen and bake up something lusciously chocolate – the problem was what to choose! 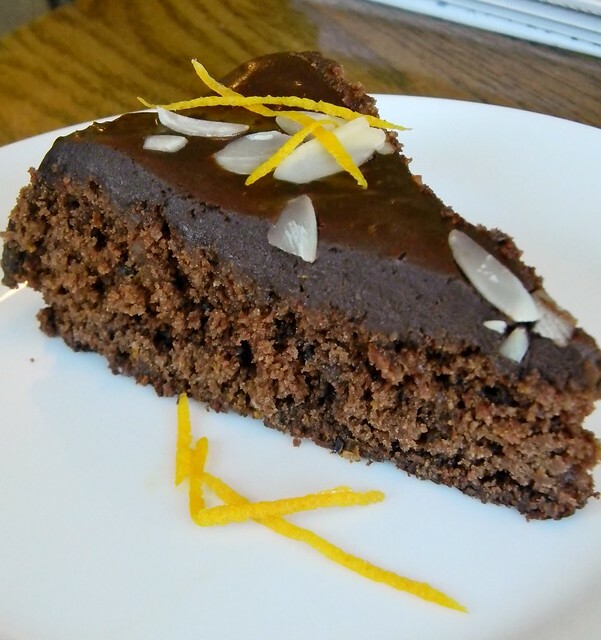 I eventually settled on the Chocolate, Orange and Almond Olive Oil Cake (p. 72) to start off. The dessert is extraordinary, and wouldn’t be out of place in an elegant bistro or trattoria, but if you can measure, pour and mix it is remarkably simple. To me, unfortunately, it doesn’t really belong in a “chocolate” book – the only element of chocolate is in the glaze (which is a separate recipe). That said, when I made the cake I added a touch of cocoa powder for a bit of “back-up” flavour. Continuing on my “chocolate and orange” kick, I knew I had to try the Chocolate Orange Sesame Truffles (p. 58), which looked spectacular in their photo and definitely involved a kick of chocolate. These, too, were extremely simple to make and relied on an unorthodox melting medium – orange juice – rather than heavy cream or milk. A dab of tahini helped re-solidify everything and they shaped nicely, even after being in the fridge for a day. 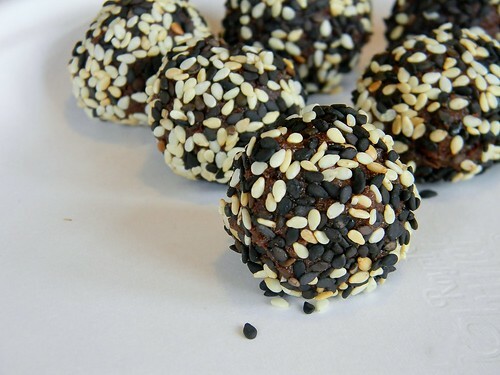 The balance of fruit, chocolate and sesame was spot on to my palate and I wouldn’t hesitate to make a plate of these for a Christmas party. 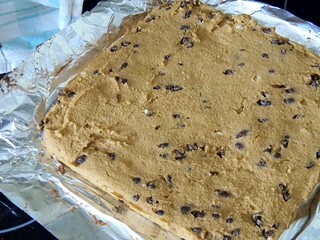 Lastly, I whipped up a pan of one of my favourites: Blondies (p. 130). Granted, blondies really have no place in a “chocolate” book either, as their whole mandate is “chocolate-free brownies”, but I have a soft spot for those bars and wanted to see how Costigan’s recipe stacked up. I had to make a few minor changes based on what I had available, and I opted to add some chocolate-covered cacao nibs along with the chocolate chips for extra pizzazz, but I have to say I was pleased by the final result and would make them again. In fact, I did make them again, for a school function, and they were thoroughly enjoyed without a word as to the lack of eggs or dairy. It is very hard to go wrong with a food as perfect as chocolate, but many people find it too difficult or time consuming to tackle in any great quantity. Not only does Fran Costigan’s Vegan Chocolate convince you that chocolate is a boon, not a burden, to the kitchen, but shows that elegant, decadent desserts are within every home cook’s reach. Furthermore, Vegan Chocolate truly erases any doubts as to the “cardboard” nature of vegan, refined sugar-free food and just may tempt more than one diner over to enjoying more meat-, dairy- and egg-free fare overall. I was so happy to read this thorough (and positive) wonderful review of Vegan Chocolate. I'm curious abou the addition of cocoa powder in the Orange Almond Olive Oil Cake. It looks good! !